"It is called Lothric, where the transitory lands of the Lords of Cinder converge." How fascinating. Time and space are still in flux in Dark Souls 3, it would seem. We know Firelink Shrine appears in the third instalment, and I'll be damned if I haven't seen the ruined spires of Anor Londo crop up here and there, but this is confirmation that we're not in Lordran as we know it. 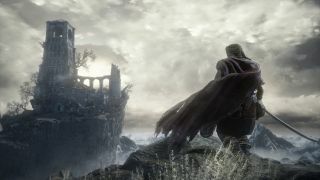 Rather, Dark Souls 3 will sit betwixt planes of existence, or so the opening cinematic suggests, but it's a fool who takes Dark Souls footage at face value. There's a brief peak at Lothric's big baddies too: Yhorm the Giant, Aldrich Saint of the Deep and Farron's Undead Legion. Excuse me while I spend all my souls in Faith.